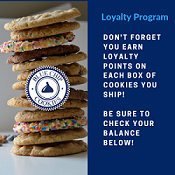 Create your own Blue Chip Cookie Bulk Crave Case, six boxes totaling, 84 cookies Choose up to 6 flavors, with 14 cookies in each box. Great for special events at your home or business! Almond Toffee Chip: Buttery toffee, Guittard semi-sweet chocolate chips, and toasted almonds make this creation exclusively Blue Chip. A fabulous dessert! Chocolate Chip: The big kahuna, the grand slam, the most incredible chocolate chip cookie you will ever taste. 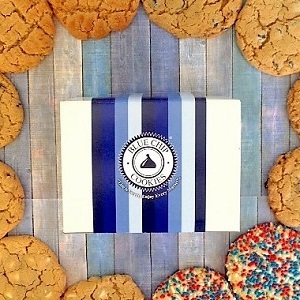 This cookie is fabulous, voted by ten cities as the best cookies! Cinnamon Delight (Snickerdoodle): Our sugar cookie infused with cinnamon and spice that has a profile that’s light and airy with great flavor. This light and delicious cookie, coated with pure cinnamon, is a "Sinful" creation! Oatmeal Raisin- Fresh oats, raisins, sprinkled with a touch of coconut makes Blue Chip's Oatmeal Raisin the best in the country! We can add walnuts if you request. Oatmeal Chocolate Chip: We take our Oatmeal recipe and add chocolate chips to it!. New for 2019.